Two New Sesterterpenes from Marine-Derived Fungus Arthrinium sp. Two new sesterterpenes together with related known terpestacin were isolated from the cultural broth of a marine fungal strain (5XNZ5-4) that lives in the gut of a marine crab. 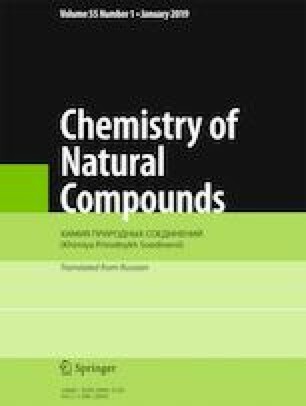 The new compounds were identified on the basis of analyses of NMR and mass spectral data. This is the first report on the oxidative derivatives of terpestacin. The new compounds showed no activity in antibacterial and cytotoxicity assays. Published in Khimiya Prirodnykh Soedinenii, No. 2, March–April, 2019, pp. 243–245. This work was supported by the Natural Science Foundation of China (NSFC Nos. 21102128 and 41406141). We thank Jianyang Pan (Pharmaceutical Informatics Institute, Zhejiang University) for performing the NMR spectrometry.